Most hail damage is not obvious to the untrained eye, but looks can be deceiving Hail that is 1.5 inches in diameter or larger can damage your shingles, siding, windows and gutters. In many cases the visible signs of damage are difficult to spot without a close inspection. 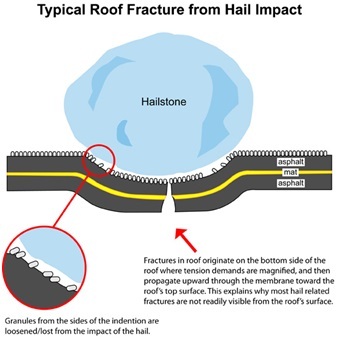 If hail is driven by high winds or the hail storm lasts for more than a few minutes, the potential for your roof to suffer damage increases significantly. Asphalt shingles will suffer dents, bruises and the loss of the protective granules that protect the asphalt from the uv light from the sun accelerating the deterioration of the roof. Larger hail stones can puncture, fracture and tear the shingles causing more imminent threat of moisture penetrating the roof system. Other factors that make roofs more susceptible to hail damage is colder temperature, unsupported shingles or multiple layers of roofing shingles. Older roofs become more brittle as the shingles harden, thus making the roof less hail resistant. Damage to windows and siding can cause moisture and air infiltration through the windows and walls of your house. This, at minimum will create higher energy bills and at worst create an opportunity for the growth of mold and mildew inside the walls. Air infiltration causes air to leak into and out of your home. Your heating system will work harder in the winter and your cooling systems work overtime in the summer. Your energy dollars are literally being thrown out the window.